Fixed appliance treatment is the most precise way to control tooth movement to achieve the perfect smile. There are three main components to such appliances including the brackets (which are attached to the teeth), archwires (the wires placed into the brackets) and auxiliaries such as elastics. The bracket helps to determine the final tooth position. The archwire acts as the motor and places the necessary forces to initiate and sustain tooth movement. The brackets can be made of metal or tooth coloured ceramic materials. Sometimes dental extractions have to be undertaken by the general dentist before starting fixed appliance treatment if space is required to correct tooth positions. The placement of fixed appliances is pain free and does not involve dental injections. Adjustments are typically undertaken at six weekly intervals. Sometimes breakages can occur and appointments have to scheduled between the main visits. The duration of fixed appliance treatment can vary between 6–18 months depending on the complexity of the case. There is some discomfort for 3–4 days following placement of fixed appliances which can be controlled by mild pain killers (e.g. paracetamol). The risks of fixed appliance treatment include dental decay (if there is excessive sugar within the diet and if tooth brushing is poor) and slight root shortening which is frequently minimal. 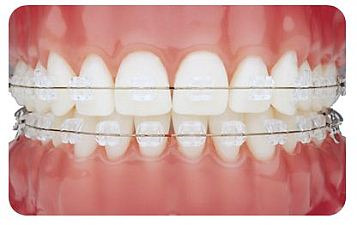 The wires used to align teeth are commonly termed 'archwires'. These are made of metal (stainless steel or nickel–titanium) materials. They can be covered with tooth coloured coatings to make them less obvious. However, these coatings do have a tendency to decay between visits and may slow tooth movement.